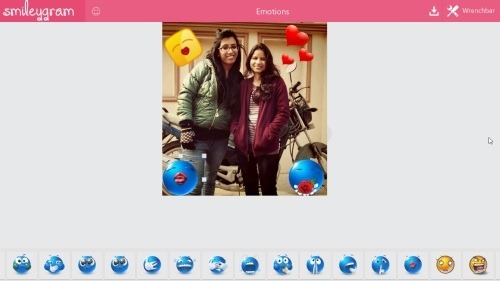 Smilygram is a free Windows 8 app to add smilies to photos. This Smilygram app for Windows 8 lets you add smilies in your memorable photos and make them lively forever. There are more than 300 smilies that can be added to your photos. You can make your photos speak and tell a funny story, using only those awesome smilies. There are six broad human emotional categories including Happy, Wicked, Cool Dude!, Expressions, Flirty/Sick, and Face Avatars. Once you are done with your smiley adding job, now you can easily save it to your local Windows 8 machine. Simple as that! As you open the app, you will be asked to select and upload an image from your local machine ? choose from among the categories using the dropdown icon ? and start selecting the smilies you want to add in your photo. A list of smilies will be opened at the bottom of the screen.You can also delete the smilies from your image. Let me quickly bring out the main features of this Windows 8 app to add smilies to photos. Lets you add smilies to your photos and make them lively. Comes with more than 300 smilies and six different categories. Lets you save photos once you have added smilies to it. Lets you delete smilies from the photos. Lets you upload photos from your local machine. Well.. I just loved this fun add smilies to photos Windows 8 app where you will find hundreds of funny smiles in various categories. It’s very simple and easy to access app. A must-have app for playing around the smilies while making your images lively. Also, check out our posts on Photo Caption App, and Frames App. Head over to the app store and look for Smilygram app. Press ‘Win+Q’ to open the Search Charm. Now, simply proceed with further installation steps and download Smilygram app in Windows 8 now. In short, Smilygram is a fun app where you can add smileys and make your photos speak and tell a funny story. Go ahead and download Smilygram app in Windows 8 now.